Hyundai Motor Co. today unveiled the company's - and Korea's - first Full Speed Electric Vehicle (FSEV) named 'BlueOn,' opening a new era in eco-friendly technology. We are proud to introduce the world to BlueOn, which was fully developed in Korea and displays Hyundai's latest technological advancements," said Dr. Hyun-Soon Lee, Vice Chairman at Hyundai's Corporate R&D Center. "Consumers' interests and demand for eco-friendly cars are rising and securing such advanced technology is critical in becoming an industry leader. Hyundai is dedicated to reducing its carbon footprint and satisfying market needs." Hyundai unveiled the car at the Blue House today, in the presence of Korean President Lee Myung-Bak and Ministers from the Ministry of Knowledge Economy and Ministry of Environment. 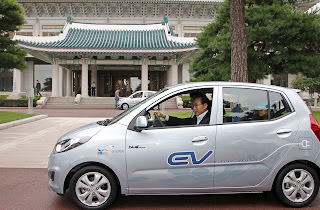 About 50 other government and electric-vehicle industry officials were also present. 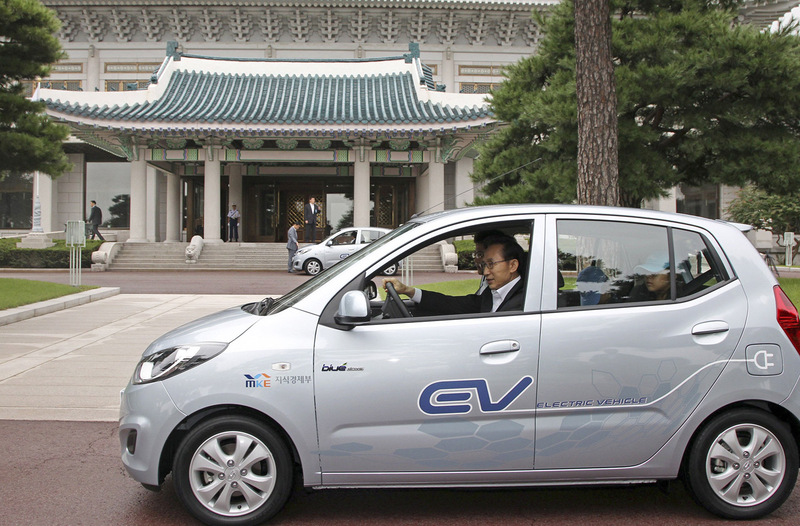 During the unveiling ceremony, President Lee and Hyundai's Vice Chairman Lee test drove one of the new vehicles together on the Blue House premises. Hyundai invested a total of about 40 billion won (about $34.2 million) over a one year period to create BlueOn, which is based on Hyundai's small hatchback, i10. The electric version of i10 was first unveiled at the Frankfurt Motor Show in 2009. Beginning with today's ceremony, Hyundai is planning to provide 30 BlueOn vehicles as test fleets to various government organizations in Korea by October. These vehicles will be mainly used to help develop and test charging infrastructures for about two years, until August 2012. Furthermore, these cars will be used for promotional purposes, starting with the upcoming G20 summit, to boost Korea's eco-friendly image. The name 'BlueOn' derives from Hyundai's Blue Drive strategy, which encompasses the company's eco-friendly products and technologies. The word 'On' symbolizes "switch on." 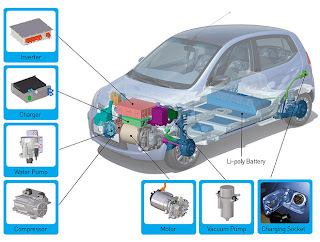 As pure electric vehicles operate only with the battery and electric motor, the battery's lifespan and storage capacity determines the vehicle's performance. Hyundai chose LiPoly batteries because compared with previous nickel-metal hydride batteries (NiMH), LiPoly delivers the same power with 30 percent less weight and 40 percent less volume, boosting efficiency and leaving more interior space for passengers. Furthermore, the car has been designed to prevent overcharging and collision-related safety issues. Hyundai also conducted hundreds of thousands of kilometers' worth of endurance testing to secure safety. BlueOn boasts a maximum speed of 130km/h and 0-100 km/h is achieved in 13.1 seconds, better than some gasoline models in the same class. In addition, the engine-driven components were electrified so that the electric motor-driven power steering, electric water pump and regenerative brake system could be adapted to BlueOn. Furthermore, for the driver's convenience, an advanced telematics system showing the charge status and location of recharging stations is installed. A 4.2-inch TFT LCD Supervision Cluster that provides voice guidance has also been installed. 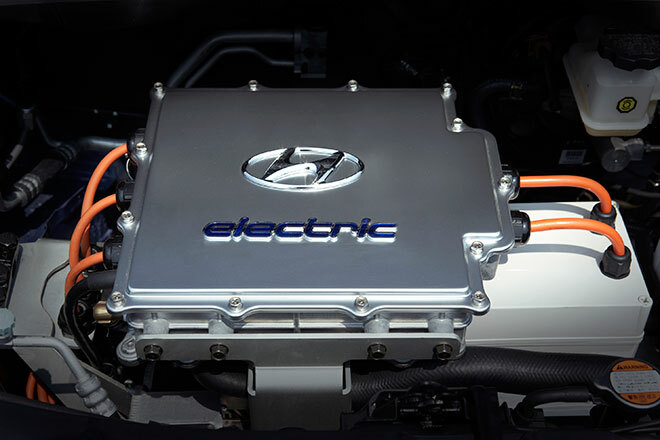 Hyundai plans to expand its manufacturing capabilities for BlueOn next year, carrying out test productions and making about 2,500 units by the end of 2012.